Other types: 5-20 in Coulomb stations. There may also be an external 5-20. New Coulomb J1772 stations installed July, 2010. Chargers were removed permanently in May, 2009. The most direct entrance is from S. Almaden Blvd. Parking in downtown San Jose. Proceed straight past the toll booth. Turn left on aisle red S11. Cross the garage to far wall at the end of the aisle. The charger is on the wall 2 stalls to the right by the lobby entry doors. It is EV only space striped green. There is an Electric Vehicle Only parking sign on the wall. The charger can be accessed from one adjacent space if that space is unoccupied. It is on the left hand side next to an walk-in entrance to the center. It is at least half way down the lot as you drive in and you need to stay to the right for a bit b/c the left side doesn't go all the way through end to end. Enter the Convention center parking garage. Take the ramp up one level. Charger is on the wall in area red S11 by the lobby entry doors. There are three ways to get in, Market St., Almaden Blvd. and San Carlos Street. Forget about San Carlos, that is the Hilton Hotel parking area. You need to move barriers if you go in that way. Enter the parking structure at S1. Keep right until S11. Make a left at first pole with S11. Go down all the way and make a right. The EV charging spot is next to the second S11 pole on the left. 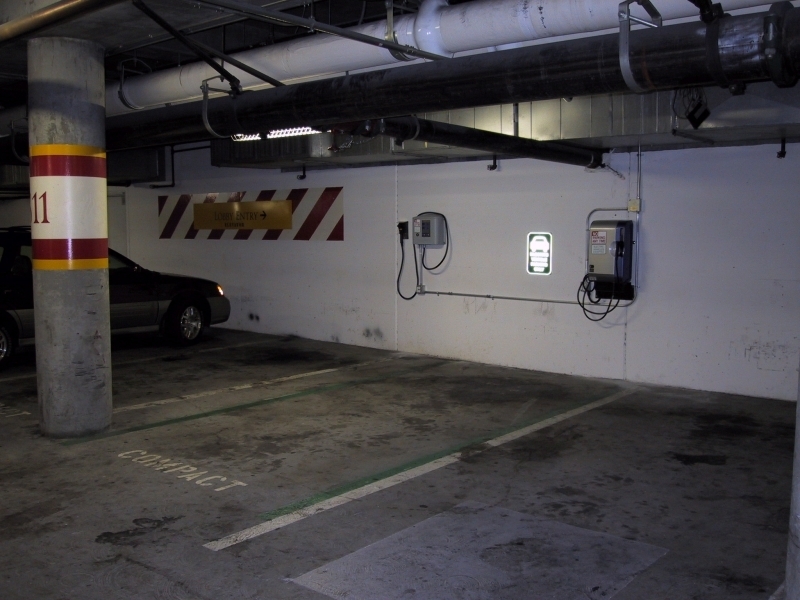 It's a green striped spot with an electric vehicle parking only sign Charger is mounted on the wall between two spots. The right hand spot could be used if it's not iced. As you enter from Market, make an immediate left. You are at L4. Make a right at the yellow public parking sign about 9 parking spaces down. Go up the ramp to the next level. Make a right at the top of the ramp and go down about 14 spaces and turn left into the stall right next to the second pole with S11 on it. The charger is a large paddle GEN1 charger and is functioning. There is excellent access to downtown San Jose with many shops and restaurants within a short walking distance, particularly along Park Avenue. The Montgomery Theater, Center for Performing Arts, Parkside Hall, Civic Auditorium are all within a block. Driver reports requested verify external 5-20. 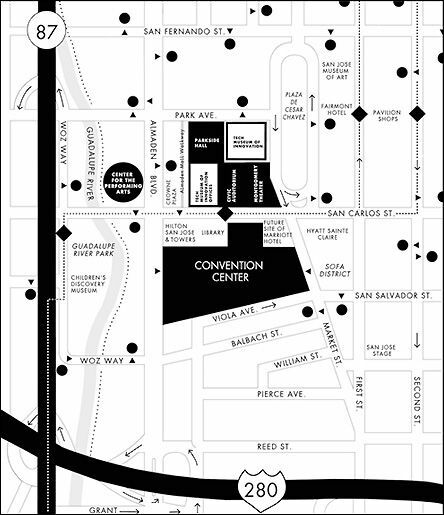 Map by Bruce Parmenter 8/10/03. 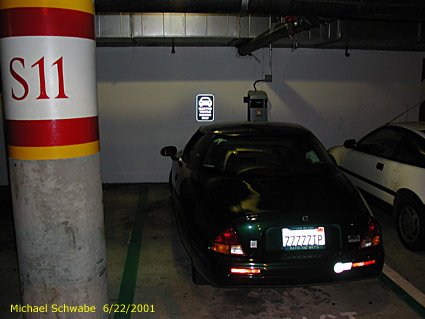 Parking spot by Michael Schwabe, 6/22/01. LPI was replaced by SPI on 4//04. New SPI installed by Electric Auto Association (EAA) on 4/3/04., Photo by Don Gillis. Generated on Sunday, 1/30/2011, at 10:45:37 PM PT from evcnall.fp7. 10/10/10: Changed to OK. Now has J1772 Charging stations. 7/31/09: Changed to DOWN LOC. See status. 7/13/2007: Added "I Was There" report. 3/8/2007: Added "I Was There" report. 3/25/2006: Added "I Was There" report. 9/5/2005: Added "I Was There" report. 9/18/2004: Added "I Was There" report. 5/16/2004: Added "I Was There" report. 5/3/2004: Added "I Was There" report. 4.4.04: New photo of SPI. Removed 1 LPI, added 1 SPI, 1 AVC. 8/30/03: Added comments and photos.